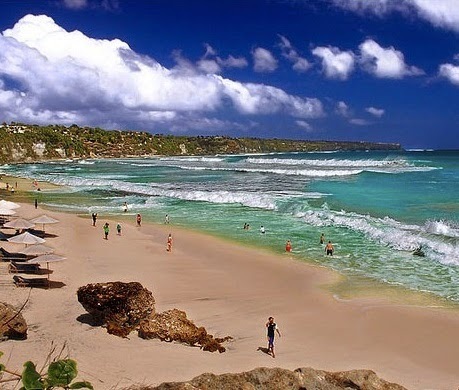 Dreamland Beach is one of the most beautiful beaches in Bali after the Kuta Beach. The beach is not far from the Uluwatu on the island is very famous for its beauty. Dreamland Beach is located in the village of Pecatu, southern part of the island of Bali. The distance is about 30 minutes from Kuta Beach. Dreamland Beach Name relatively unusual place names on the island of Bali, because the use of English instead of using the local language. History Dreamland Beach name originally derived from the plan will be built a tourist area's largest and most unique in the area east asia region Pecatu. However, since the monetary crisis in 1998 abandoned plans of this mega project. Many residents around the Pecatu hope with this project and finally they call the region as "Dreamland". As you enter Dreamland Beach tourist area, your eyes will be enchanted by the beauty of this beach. The area is hilly and rugged make you look as if the lower beach area on the sea. Dreamland is a beach surrounded by cliffs towering and large rocks. As you descend the steps to the rocks and the beach, you will be dazzled by views of rock cliffs topped with green pasture that is high enough. Many foreign and local tourists who like to enjoy in the meadow area. Dreamland Beach area is also very alluring eyes. You will be captivated by a whitish brown sand is clean with a steep gully. You can enjoy the beauty of the sunset or sunset on the narrow coastal area directly beneath the steep rock walls. Dreamland Sea region also has a high and big waves. Therefore, many surfers like to surf in this beach. Dreamland is also one surfing destination in Bali. You can rent umbrellas provided along the coast to avoid the heat of the sun. If you want to swim but did not bring a change of clothes, you can buy in the tourist area of ​​Dreamland. Once down the stairs, a line of clothing merchants will offer you their wares. In the area there are many Hotels and villas on Dreamland beach as tour support. There are some resorts that offer a unique feel to the visitors, the hotel facilities on a cliff with an amazing view of the beach. The area around the Dreamland Beach is the only place in Bali that use international law, so that the rules on the beach is free, for example: you are free to drink alcoholic beverages.